There is no denying that my posts are few and far between. I do have a good excuse though. When I’m not sitting at my sewing machine or at work, you can usually find me in the kitchen. My wife and I love to cook. So much so that we decided to write a cookbook together. We did all of the recipe development, testing, and photography ourselves, and I’m extremely proud of the finished product, even if it meant I had little time to sew during the last twelve months. So…here it is. Breakfast for Dinner! Doesn’t that phrase just bring a smile to your face? I mean, who doesn’t like breakfast for dinner? 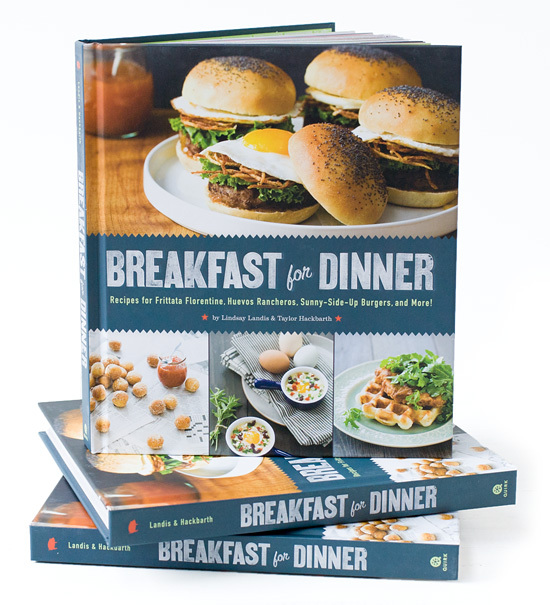 We are giving away five signed copies at my wife’s amazing food blog Love and Olive Oil. She did a pretty cool behind the scenes post about it too, complete with messy kitchen shots, me doing dishes with silly faces, and all kinds of cat shenanigans. The book is available for pre-order at Amazon currently, and will be hitting the shelves of book stores on February 12th. Also, if you happen to be in Tennessee or the San Francisco bay area, we will be doing a few book signing events soon. Come out and see us. We would love to meet you! From time to time I get e-mails from readers who are interested in learning how to make their own clothing. Those who get in touch are usually looking for a starting place or advice on which sewing machine they should buy. Since TaylorTailor is three years old this month, I thought I would try to share my thoughts on the topic. This is mainly intended for those who have never sewn anything before and is in no way comprehensive. You might be disappointed if you are looking for technical advice or a step-by-step guide; buy this model of sewing machine, buy this special book, turn to page 9, and BOOM, you will have a pair of jeans. Instead, what follows are basically the steps I went through to get started. Hopefully it is helpful to others who might be thinking about learning how to sew. I am in no way an expert, or have any formal training with pattern making or sewing. While I do have an amazingly helpful mentor/teacher here in Nashville, I’ve learned quite a bit on my own as well as from other blogs and websites. I may not do things the way a professional pattern maker or commercial sewing factory would do them, but I do what works for me with the knowledge and equipment I have on hand. My first bit of advice is that you CAN do this. Don’t let lack of knowledge stop you from trying something new. I had no idea what a bobbin is or what seam allowances are when I started. With that said, making a piece of clothing that looks like it came from a store, that you are proud to wear in public, is hard work. 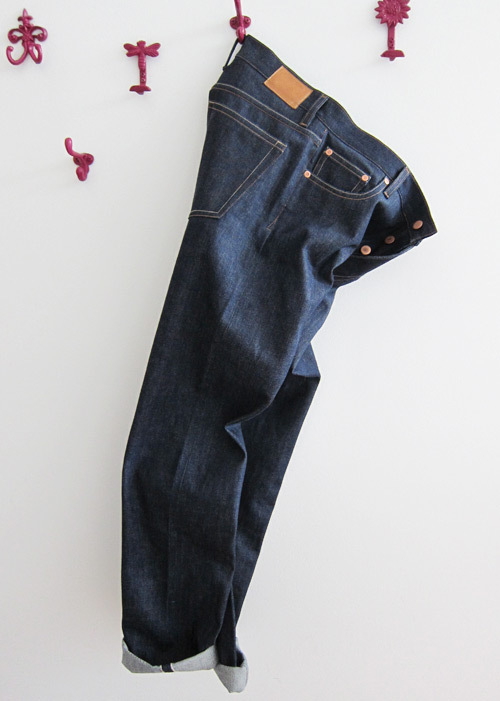 Don’t expect to complete a shirt in a Saturday afternoon or quickly throw together a pair of jeans. This stuff takes time, lots of it, especially if you’ve never sewn before. I don’t mean that last part as discouragement. If your expectations are aligned properly going in, you won’t be disappointed when you’ve spent several weeks on the same project and it still isn’t finished. Take your time, learn as you go, and enjoy the process however long it may be. 1. First, decide what types of garments/accessories you want to make, and try to gauge how committed you are going to be to learning something new. This will have an effect on how much you budget for your first sewing machine and which type of machine you decide to buy. 2. Get a sewing machine. Choosing the right machine really comes down to budget, personal preferences, and in some cases, the types of things you want to make. Here are the machines I use. I can’t make a specific recommendation for a machine that will work for every beginner, especially if I’ve never used it myself. Sewing machines generally fall into two categories, those made for “domestic” or “household” use, and industrial sewing machines. Pros of household/domestic sewing machines: portable, take up little space, most can do a variety of stitch types, they are versatile. Cons of household/domestic sewing machines: lack power and speed, not ideal for really heavy materials, they can be less durable, although I’m sure a good household machine that is properly cared for can last quite a few years. Pros of industrial sewing machines: powerful, retain power even at low speeds, ability to sew very fast, heavy duty (note: this doesn’t mean that they can all sew heavy duty materials. 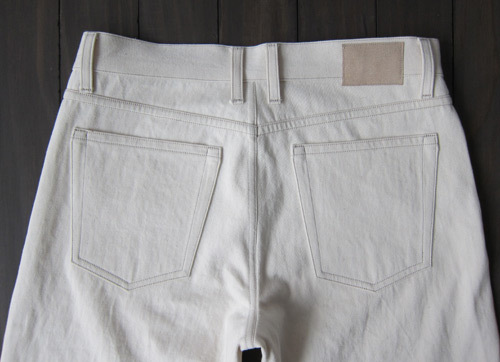 Depending on the machine, they can be set up for light or heavy work), made to do one task (such as a straight lockstitch) and do it really well. 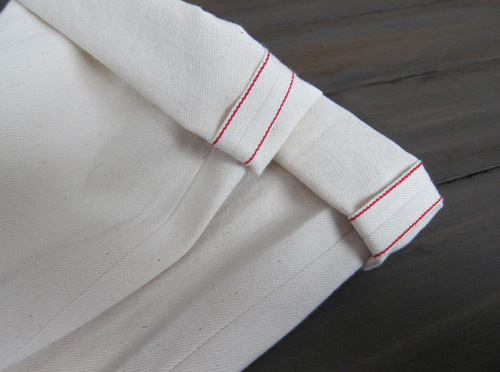 Cons of industrial sewing machines: uni-taskers – generally they can only do one type of stitch, need different machines to do different types of stitches (straight, zig zag, bar tack, etc.) not portable, weigh a lot, need dedicated place to put them. I’ve never had any problems with my industrial machine. The thing just works, and it works every time I turn it on. No fuss, no babying it, no mechanical issues. All other things being equal, if you have the space and the budget (a simple industrial can be cheaper than a complicated domestic) I would recommend an industrial sewing machine. Again, this is a personal preference, and after researching machines you might come to a different conclusion. 3. Learn how to use your machine. If you don’t have a friend or relative to show you the basics, I would suggest checking out a local fabric/sewing supply store. If they don’t offer classes for beginners, they are likely to know someone who offers private lessons who can get you started. Once you know a few basic things like how to adjust the thread tension, how to wind a bobbin, how to back tack, and how to change a needle, you are ready to start with your first project. 4. Keep it simple for your first couple of projects. I wanted to start with a three piece suit when I first got interested in sewing. My wife talked me down and convinced me to start with an apron. I’m glad she did. I’ve been sewing for three years and I’m still not ready to tackle something like a mens suit. There are lots of commercial patterns available for beginners. With these simple projects you will develop your sewing skills, continue to learn the quirks of your machine, and get a feel for what you like and don’t like to sew. 5. 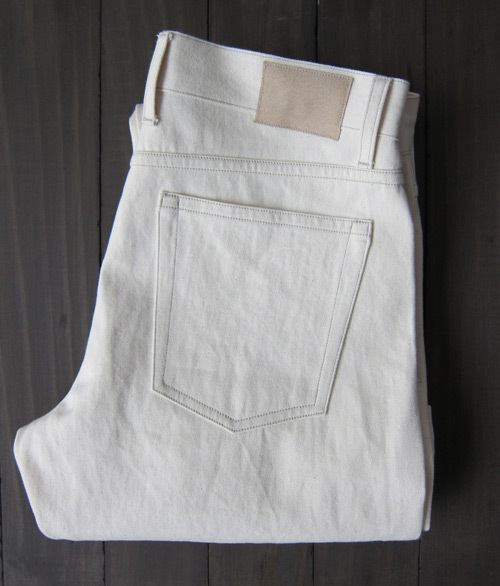 After “suffering” though a few aprons or pairs of pajamas, choose a project that is a little more complicated, something that might eventually turn into a piece of clothing you wear in public. For me, this was a pair of jeans. You might find a commercial pattern for this project, or you might want to make your own pattern. Besides having a genuine interest in learning how to design and make my own patterns, I also decided to do so out of necessity. The commercial pattern business really seems to focus a lot more on women’s clothing, which makes sense given that most of their customers are women. But, for a guy who is interested in making his own clothes this left me with few options for patterns, and I’m extremely picky in terms of fit and style. The book I use to make patterns can be found here. 6. Once you’ve decided on a project and have a pattern in hand, make a test garment, or two, or three. For every new pattern I draft, I make at least two or three test garments out of cheap practice muslin before cutting into nice fabric. With each test garment, I make adjustments to the pattern and modify the fit as needed. There is no sense in ruining a nice piece of fabric with a pattern that doesn’t fit the way you want it to. As far as learning construction techniques goes, there are TONS of sewing books on the market. Here are the two that I use the most often for shirts and pants: David Coffin- Shirtmaking, David Coffin- Making Trousers for Men and Women. Another great way to learn construction techniques and some pattern making is to inspect store bought clothing. 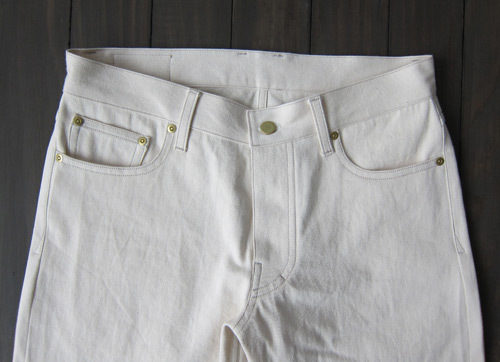 You can learn a lot by turning clothes inside out and inspecting seams, pockets, etc. Then there is good old fashion experience. 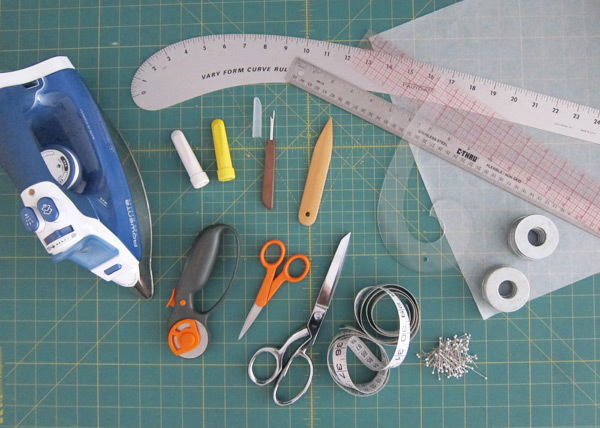 The more you sew, the more you learn, the more the construction part will become intuitive. Iron/Ironing board- If you are just starting out, the iron/ironing board you currently have is probably fine. At some point though, you will want to invest in a decent quality iron and a nice ironing board. 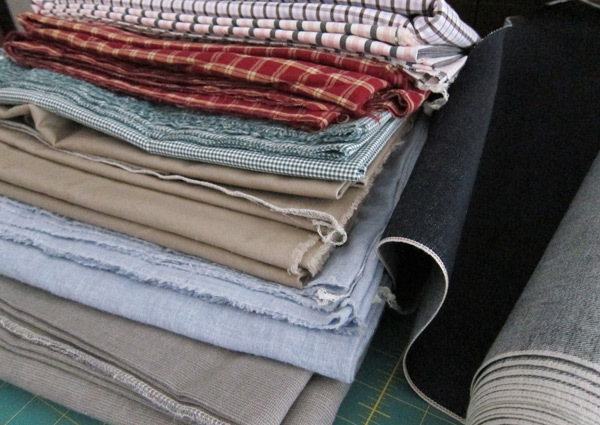 For many projects, you will spend more time pressing than at your sewing machine. Chalk wheels(s)- For marking positions on fabric. Seam ripper- This will be your best friend when you make a mistake. Point turner- Not always essential, but can be helpful turning various kinds of points. Rulers/curves- For pattern drafting and measuring during construction. Tracing paper- For pattern drafting and modification. Pattern weights- I like to use large round washers. Rotary cutter and cutting mat- When used with pattern weights, the best way to cut fabric in my opinion. Shears/scissors- for trimming seam allowances and other cuts, have a pair for fabric only, no paper, cardboard, or other materials which dull the blades quicker. Flexible tape measure- Great for making fit adjustments. Pins- To temporarily hold fabric pieces together before sewing. 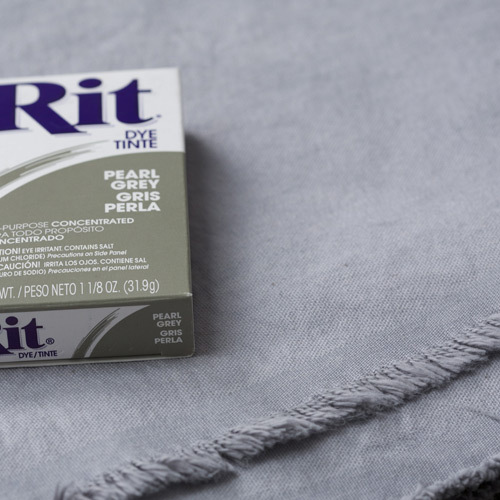 Pins tend to distort fabric, so use them sparingly and only when absolutely necessary. With the beginning of a new year approaching, this might be the perfect time to start a new hobby and learn how to make your own clothing. As always, feel free to get in touch if I can help in any way. The oxford cloth button down shirt is a staple in many wardrobes. This one is made out of 1oo% cotton with sew-in interfacing for both the collar and cuffs. I used two layers of interfacing in the collar and collar stand for added structure, which may have contributed to somewhat rounded collar points. Despite trimming close to my seam allowances, the second layer of interfacing adds some extra bulk. Some shirt collars are actually designed to have rounded points, but I am usually shooting for something a little sharper. I like that the rounded corners contribute to a more casual look, but hopefully with practice, I can achieve sharper collar points. I made a few adjustments to my pattern since the last time I made shirts. Slight adjustment to the curve in the yoke/shirt back seam. Removed a little bit of ease below the armhole along the side seams, and took out a little bit of extra room at center back near the waist line. I’m still trying to find the right balance between too loose and boxy, and an overly slim, tight fit. I want a sharp “tailored” look, but don’t want a shirt that strains and pulls with every move. Lengthened sleeve plackets to make rolling up my sleeves a little easier. Lengthened shirt tails to help keep the shirt tucked in. I would love to hear your favorite techniques and tricks for constructing collars/collar stands, techniques for joining the collar stand to the shirt fronts, and which methods you use to attach cuffs to sleeves. I’ve been using David Coffin’s instructions from his Shirtmaking book where the collar stand is sewn to the neckline before the collar is attached to the stand. He uses a similar method to make cuffs, but I’m always looking for new construction techniques. Some slouchy, poor posture fit pics. All of the clothing I have made so far, as well as the canvas backpack I recently finished, is made out of 100% cotton fabric. 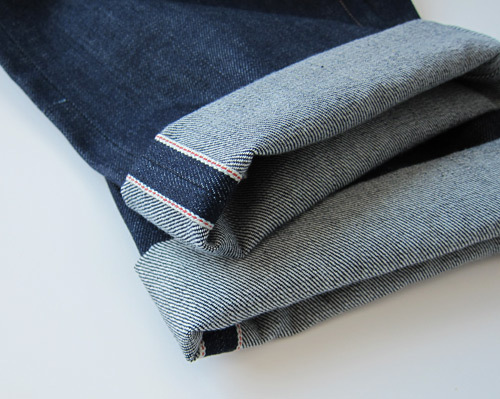 Other than wool and linen, cotton is pretty much the standard for all non-athletic menswear, and yet I found myself wondering, how many people (including myself) give any thought to where cotton actually comes from. The raw materials that go into those neatly stacked bolts of fabric in a fabric store, or the perfectly folded shirts in a retail clothing shop have undergone so much change and processing that they barely resemble their original form. 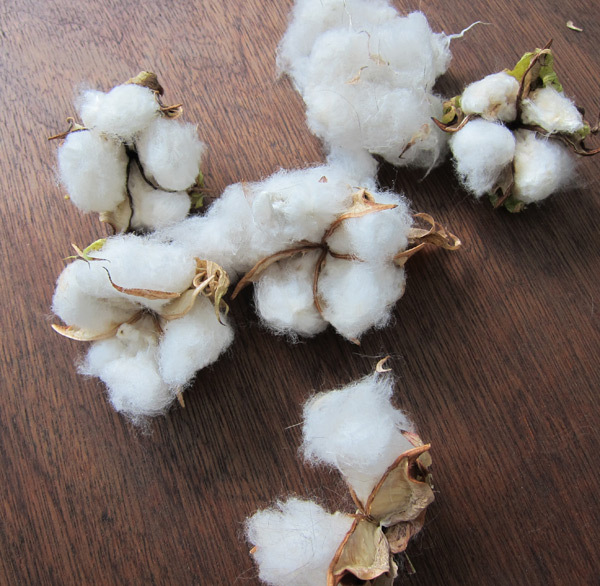 We can’t exactly wear raw cotton fibers, so this processing is necessary, but how many times have you thought of that spread collar, oxford cloth, button-down shirt as a something that started out as a plant? I decided that I want to know more about where the shirt on my back comes from, or at least learn a little about the plant from which my clothing is derived. So, this past summer I did a little gardening experiment and grew some cotton on my porch. 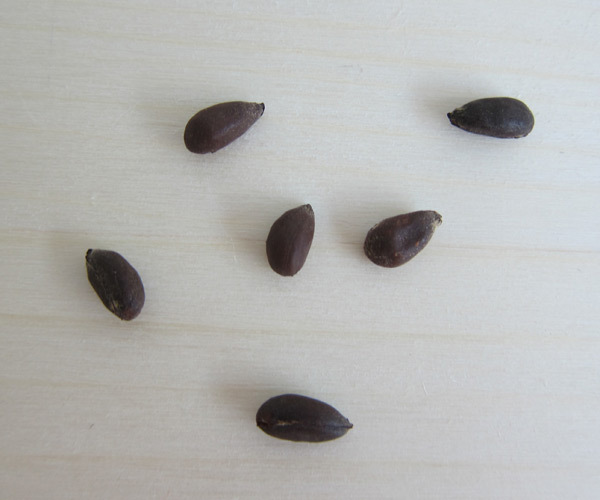 It’s hard to believe that so much of our clothing starts out as these little seeds. 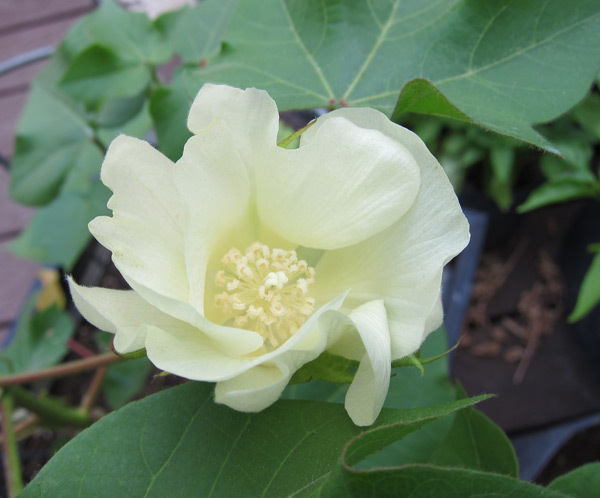 When the cotton plant blooms, it has these gorgeous, delicate, yellow flowers that only stick around for a day or two. They quickly turn a light purple color and fall off. From here the cotton bolls start to form. 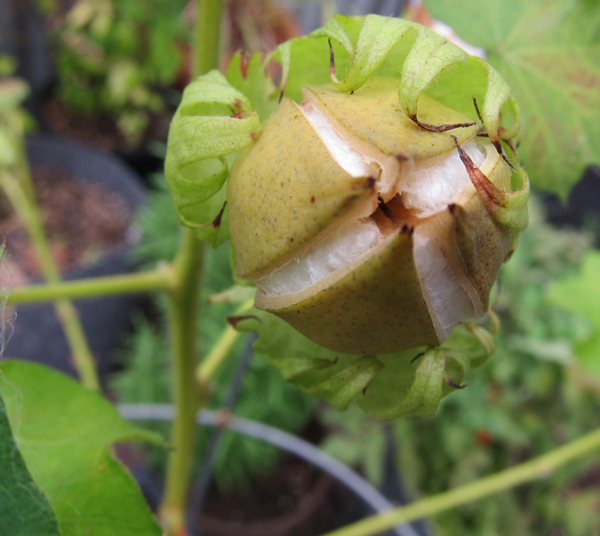 After a week or two, the bolls begin to open up and you can see the cotton fibers inside. 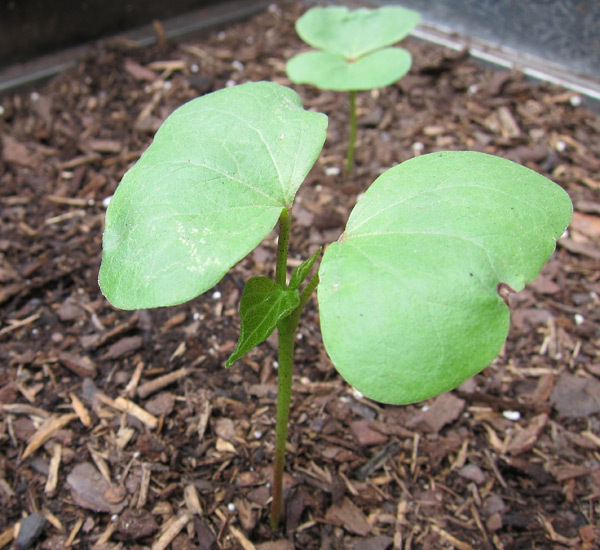 Once the cotton bolls fully opened and dried out, I removed them from the plant. There is an old cotton mill about 100 yards from where I live, but unfortunately it is no longer in use. 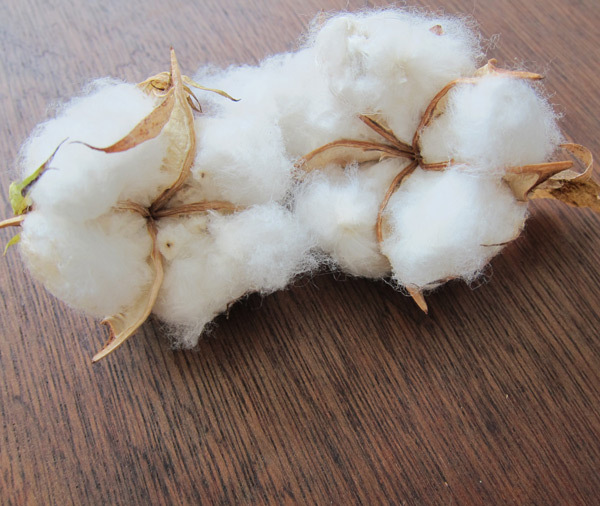 I would love to go see the next step in the fabric production process, where cotton bolls like these ones are turned into something that resembles the fabric we have come to love and depend on. When I first started thinking about making a back pack, I knew I wanted to use canvas, and I knew I wanted a simple “traditional” design. My goal was to create something that could hold a couple days worth of clothing for a weekend getaway, or be used as an airplane carry-on. Serious hiking, climbing, or long heavy hauling were not factors I considered when designing and constructing this pack. 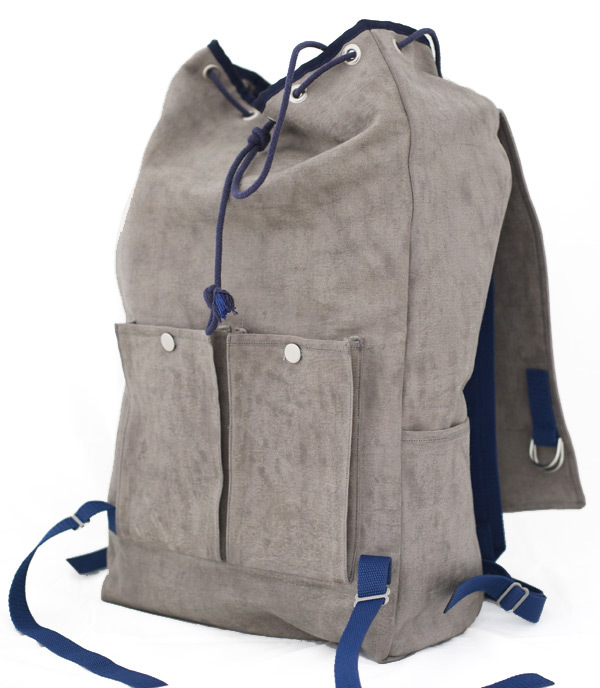 For inspiration, I looked to both the Archival Rucksack and Makr Farm Ruck Sack, which both seem to be nicely designed and well made. 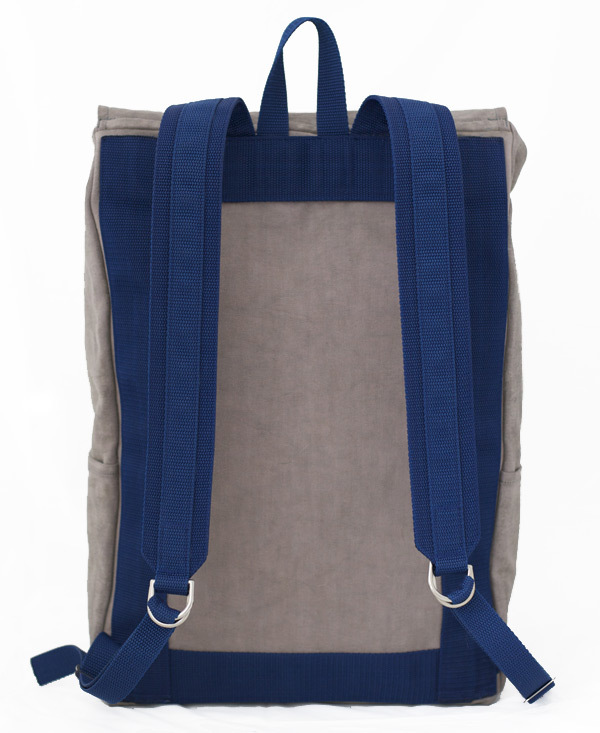 The pack features a double layer of canvas throughout the body and flap for durability and some structure. Ideally, I would have preferred to use one layer of really heavy canvas, but as I mentioned in the post about the canvas I dyed for this pack, I found the canvas on sale and couldn’t pass it up. At the time it was the heaviest canvas available in the store, and while I saved a little money, I should have just bought the right fabric to begin with. All things considered though, I’m pretty happy with the way it turned out. All of the blue webbing is polypropylene, and while it isn’t my preferred material, it was easy to work with. Cotton webbing would have been a nice option, but was difficult to find in small quantities. I also thought about using leather for the shoulder straps and flap closure, and on a future pack I may do so. Working with leather, however, requires a lot of practice, special tools, and skills that I haven’t even begin to learn. For both the shoulder straps and flap closure I used a simple double D-ring setup for adjustments. This works great for the shoulder straps because I don’t need to change the length of those very often, but the D-rings make getting into the main compartment a little difficult. On my next pack, I will probably use different hardware such as a lobster claw, or some type of snap hook to close the top flap. The main compartment closes with a drawstring woven through grommets, which were surprisingly easy to install. I decided to lightly wax the outside layer of canvas with Otter Wax to give some texture, a weathered look, and most importantly, resistance to water. I should probably apply a heavier coat for more protection, but this is something I can do at a later date. 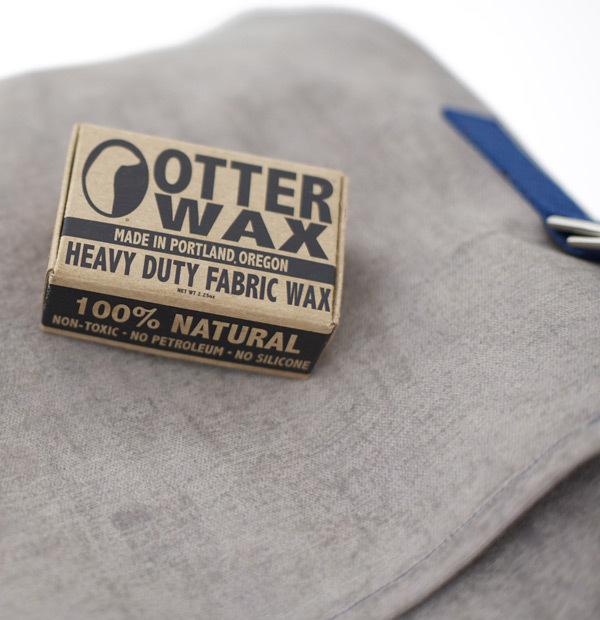 I chose Otter Wax because it is a natural product, is environmentally friendly, and is relatively easy to apply. 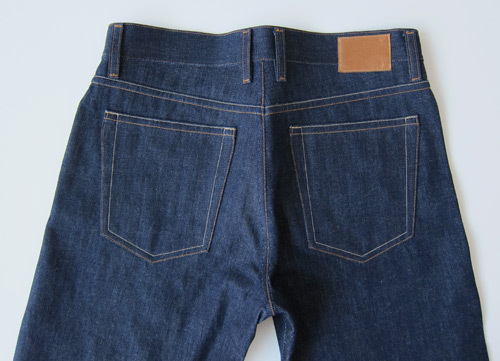 The two outer pockets have slots for pens/pencils, and close with a jeans style button. 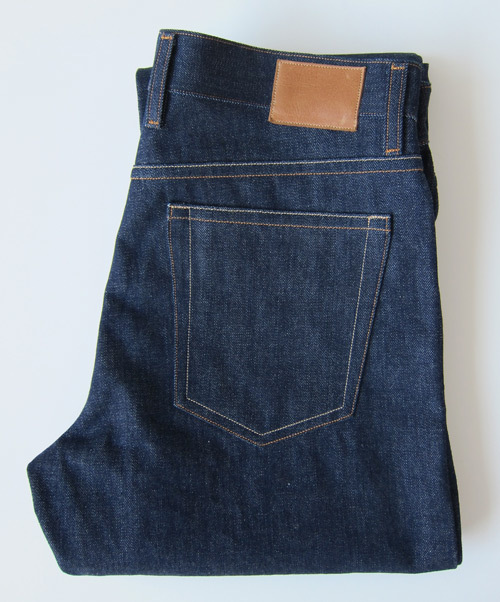 There are also several pockets on the inside for thin, low profile items. After two and a half years of using a free WordPress theme, I’ve finally got myself a brand new custom design for the blog! My first theme wasn’t necessarily bad considering it was free, but my wife and I actually own and run a web and graphic design business. I was long overdue for a, um… “tailored” design. We’ve been so busy the last couple of years (a good thing of course) that we rarely have time to work on personal projects. While I was off adjusting my shirt pattern this past weekend, my wife surprised me by designing a new theme for Taylor Tailor. Isn’t she awesome? The logo is based off of the vintage Taylor Tailor sign I picked up off of eBay a while back. I now have a wider area for my images, and overall a nice clean, simple look. I couldn’t be happier with it. In addition to learning how to make my own clothes, I’ve also started learning how to make my own beer! With the new design I’ll be adding a section about my brewing adventures, so don’t be surprised if you see a beer post here and there thrown in amongst the denim, shirts, and other sewing projects. Now that my content area is wider, I have to re-edit the images I had planned for the backpack I made with the canvas I posted about a few weeks ago. 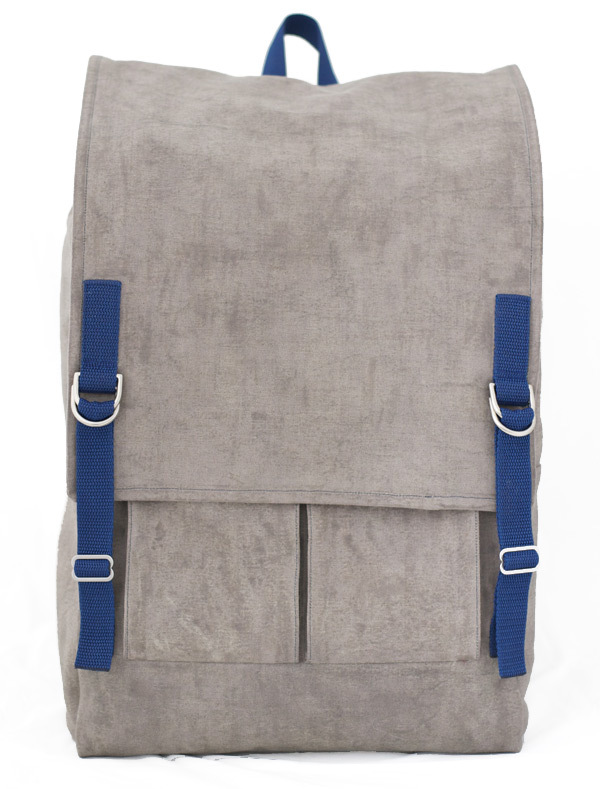 As soon as I re-size the images I’ll get the backpack posted. 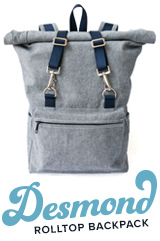 I bought a couple of yards of canvas on sale knowing that I wanted to make a canvas backpack at some point. When it actually came time to make the backpack (post coming soon), I realized that the natural canvas color would quickly get really dirty. I’ll just dye it I thought, it’s easy right? The process is actually pretty easy. The hard part is getting the right color. This was my first time dying anything, and while it was fun, I’ll probably look a little harder for the exact color of fabric I want next time, rather than trying to dye fabric to a certain color. 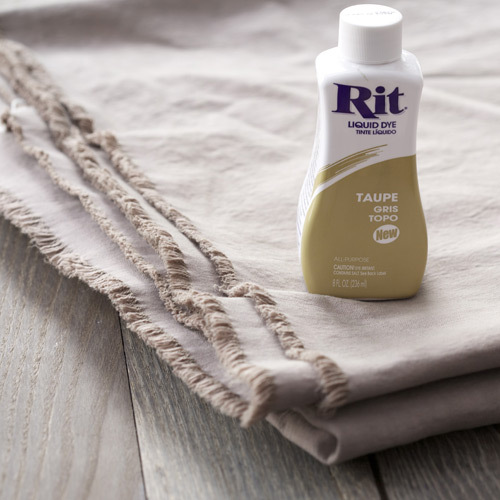 I used a simple, inexpensive dye that you can find at most hobby/craft stores. I started with a grey powder dye. If the first dying session had resulted in the color shown on the box, I would have been pretty happy with the outcome. Unfortunately, the result was a very cool light grey, borderline lavender color. Not exactly what I had in mind for a backpack. I followed the instructions, used two packages of dye, washed the fabric before I started, etc. Maybe my water wasn’t hot enough? Maybe my sink was too small? I’m not sure what went wrong, but I’ll blame my lack of experience rather than the dye. 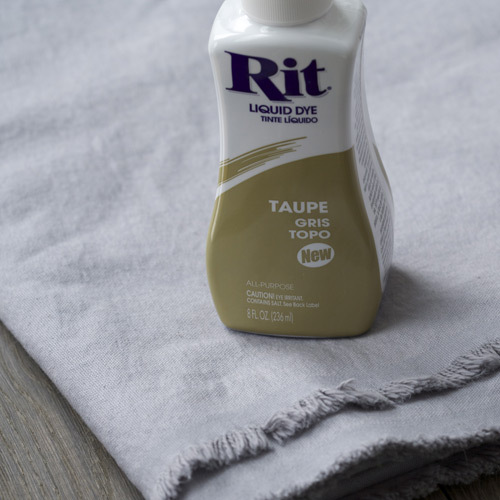 So…I switched to liquid dye, picked out a “nice” taupe color and repeated the process. My lavender canvas turned into the color shown below, which is actually fairly close to the color on the bottle, and not a bad choice for a backpack. 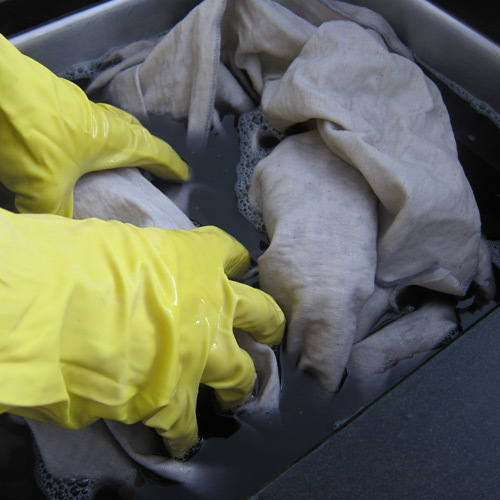 If I do decide to embark on a dying adventure again, I think I’ll try to seek out a non-conventional, more organic approach and use something like coffee or tea to give plain cotton some color. This will do for now. I hope to have the backpack I made with this canvas up soon. This is pretty much a repeat of my last post except in a different color. 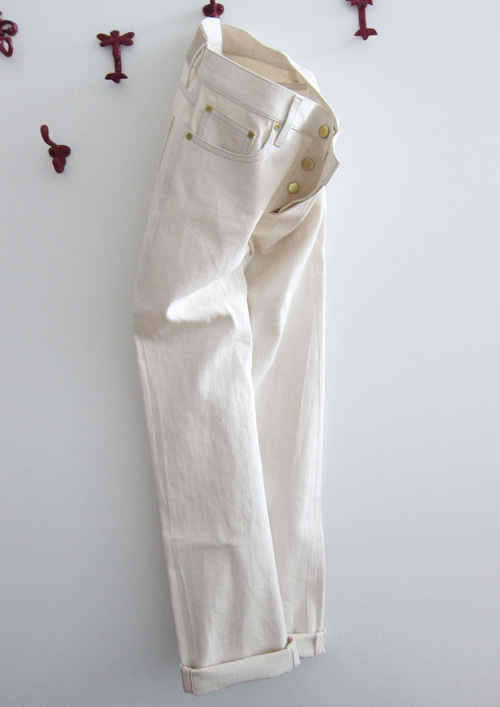 I used the same pattern but made this pair of jeans out of a lighter weight, natural cream colored denim. Up close this denim basically looks like painting canvas, sprinkled with little brown and black bits that I assume are left over from the cotton plant. 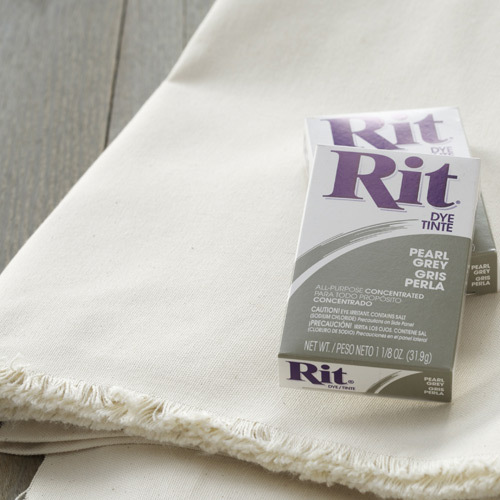 Hopefully this 11.5oz fabric will stay cooler on those hot, humid summer days. So I got a little distracted from my jacket project. I’ve had this remnant piece of denim from the Supply Shop that’s been taunting me to turn it into a pair of jeans, and I finally gave in. I’m putting the jacket on hold for a little while to make some other things from my fabric stash, but I did end up finding a nice piece of cotton and some lining for the jacket when I get around to finishing the pattern. Progress on my jacket project is extremely slow but steady. 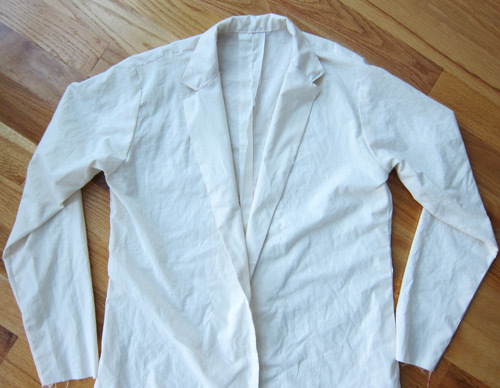 I’ve managed to throw together another hunk of muslin to quickly test out the basic shell of my men’s jacket pattern. At this point I’m just making sure the collar/lapel pattern pieces actually work together. I’m not concerned about how the collar notches look or how the lapels roll/lay on this test garment. This was my first attempt at making a notched lapel and found it somewhat difficult. I haven’t consulted my tailoring books yet (I should have), but I’d love to hear about any good online resources for notched lapel construction. From here I need to add some shape to the side seams and center back seam, decide what I want to do for darts, and start the lining pattern. I made a quick list of projects that I hope to complete in 2012. My main focus here is building a wardrobe from scratch so I’m sticking to the basics: shirts, pants, and a jacket. This jacket is a priority, but I may end up making some of these other things below first. It seems like a fairly short list for an entire year, but this is more than I completed in 2011. Who knows, maybe I’ll pick up the pace and get even more done!